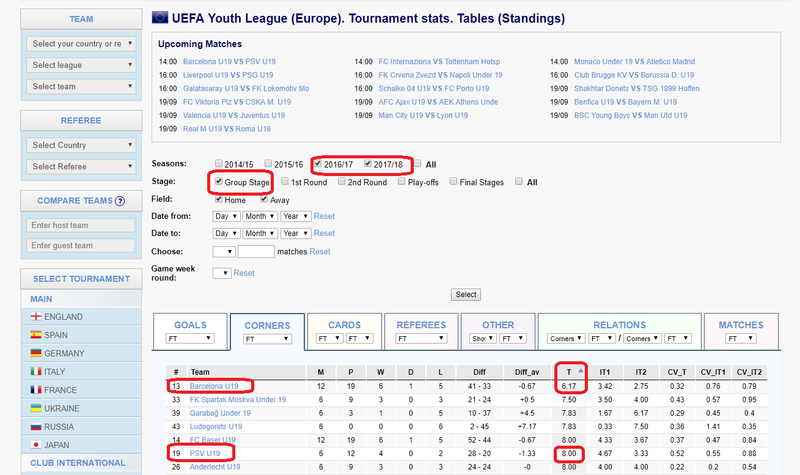 Corner-stats.com team paid attention to this match, due to the fact that there are teams that in the group stages of UEFA Youth League in the last 2 seasons had a small average total of corners. Therefore, it is logical to assume that the match will have a few corners. Barcelona (19) on the average had a total corners 6.17 per match, and PSV (19) on average - 8.00 corners per match. Bookmaker believes that the match will have more than 9.5 corners, setting the odds 1.875, which is contrary to the statistics. • 3 of Barcelona's 4 home international matches (19) with teams similar to PSV (19) in the 2016-2018 season (see the screenshot below for more details). Team site Corner-stats.com considers the bet on the Asian total corners under 9.5 at odds 1.925 at Bet365 will win.